Lathe turned on multiple axis from ailanthus wood. The piece is then carved; sand blasted and finished several different ways to create the desired effect. "Working with wood is part of my everyday life. It is my connection to the earth and the environment in which I live. 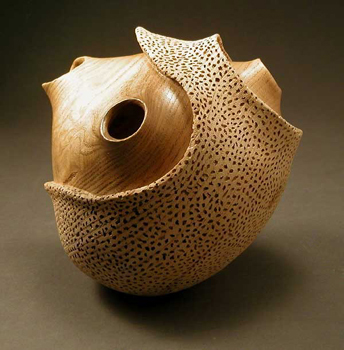 While pursuing my Bachelor of Fine Arts degree in photography and sculpture, I became interested in the art of woodturning. My philosophy has always been to work in harmony with our environment and not to destroy something in order to create something. In all my art, I use only recycled and easily sustainable woods. Being conscious of this has allowed me to work with the subtle beauty and dimension this discarded wood possesses. My intent as an artist is to express my feelings about nature, my family and natural processes. I work in series or bodies of work, which allows me to explore these issues in depth. Throughout the creative process I am continually reminded that I have not and will not ever be content. I will continue to create and strive for that body of work that has yet to be conceived."